Acer's range of media centre laptops has always impressed us, managing to combine a wealth of features with strong performance and great usability – the 18.4-inch Acer Aspire 8935G-904G1TBwn is another great example. 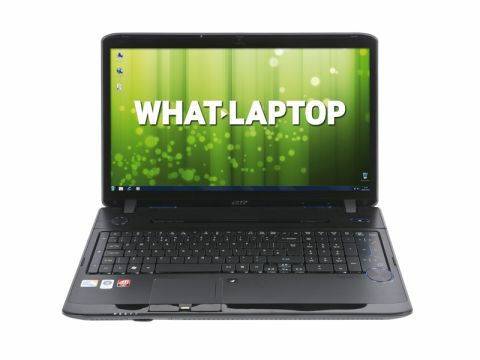 Employing powerful components from a previous generation – an Intel Core 2 Quad processor, rather than Intel's latest Core range – Acer has managed to keep the price low, while also providing quad-core power. This laptop is great for multitasking resource-heavy applications, but it's impossible to ignore the difference in performance offered by this chip and the latest Intel range. If you want true power, the Mesh Edge DX11-R is a better option. Graphically the Acer provides punch and, although the Mesh ultimately provides better gaming performance, this laptop is a great choice for those who want to use high-end editing software and also make time for playing the latest gaming titles. Carrying out multimedia tasks such as these is a pleasure on the spacious 18.4-inch screen. The full 1080p high-definition resolution provides a razor sharp image, with excellent colour and contrast enhanced by the Super-TFT screen coating. This is also quite a reflective screen, however, and is only suited for use indoors away from bright light. This is handy, as you're not going to want to travel far with this laptop, as its large size, 4.4kg weight and truly miserable 95-minute battery life limits portability. The backlit keyboard features Acer's unique design whereby the keys stand up from the chassis, with a gap between each letter. The typing experience can't match the Sony VAIO VPCEC2SOE/W, but it's firm enough. Where the Acer really excels is its comprehensive features list. The 1TB hard drive provides plenty storage. There's also a Blu-ray optical drive in place to complement the excellent screen, and an integrated TV tuner with aerial and remote, allowing you to comfortably watch digital TV at home or on the move. One final point of note is that Windows Vista is included rather than the newer Windows 7 operating system. This may not bother many users, but we've found Windows 7 to be a far more intuitive and resource-light operating system to use. We were very impressed by the Acer Aspire 8935G-904G1TBwn. While it uses older components than other laptops, for most potential buyers there is still more than enough power on offer here for everyday use. With portability the laptop's only Achilles heel, it was the list of features that impressed us most, making this a fantastic desktop replacement option for the whole family.